With more than 3 billion of downloads, WhatsApp Messenger is presently the most downloaded instant messaging app. The reason is mainly because WhatsApp lets you send and receive messages, images, videos and other multimedia files freely. In reality, there are lots of cases for which you need to have some important WhatsApp messages exported and written in black and white on the paper. However, neither mobile phones nor WhatsApp has a built-in option to print WhatsApp chats or photos. 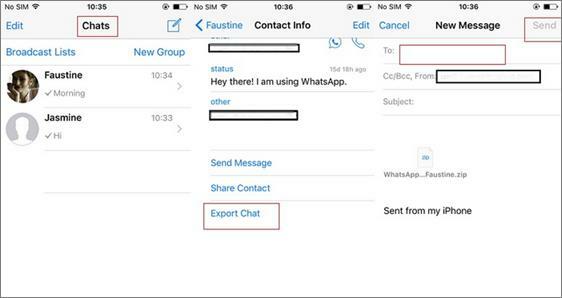 Anyway, there are other workarounds available for you to print WhatsApp conversation on iPhone and Android. To know how it is implemented, please make sure to check out the following two methods. 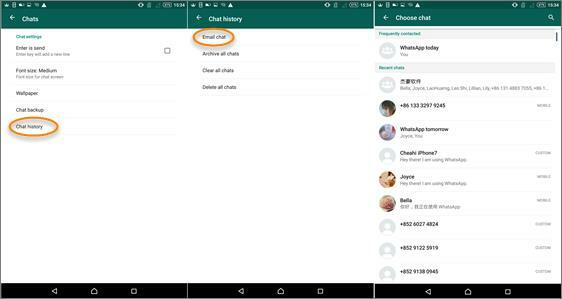 Do you know how to print WhatsApp chat history which is still stored in WhatsApp on your Android/iOS device? Actually, you can easily do that using an email. Let’s get started. Open your WhatsApp and go to WhatsApp Settings > Chats > Chat History > Email chat. Next it will prompt you to select a conversation to send to your mailbox in .TXT format. 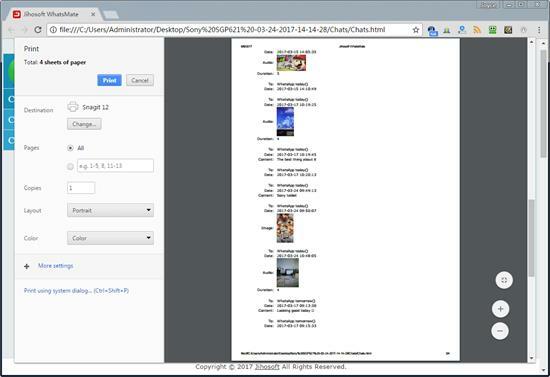 Then you need to sign into your email account on your computer, download the chat history .TXT file and print it out. Open the conversation which you want to print, and tap on the contact/group name at the top. When you come to the Contact/Group Info, tap on Export Chat option, and then a pop-up box appears and asks you whether you want to attach media files or not. Finally, type in your email account and send the chat history. After that, go to your mailbox to download and print the chats. This method is a little bit troublesome but totally free of charge. Yet, if you are eager to print the deleted WhatsApp chats, it doesn’t seem to work. Hence, here comes the second solution. Do you desperately want to print some WhatsApp conversations on mobile for a law case, but they have been deleted accidentally or intentionally? In order to print those lost WhatsApp messages, you must have to recover them first. 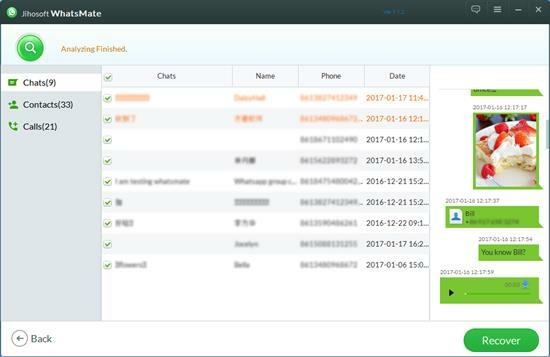 But you needn’t worry as Jihosoft WhatsMate will help you recover WhatsApp data from Android/iPhone even if you don’t have backup. If you not only want to print WhatsApp messages but also need to print WhatsApp photos, call history and contacts, please remember to also choose these file types to recover. Warm Tip: This program supports all popular phones, such as iPhone 7 Plus, iPhone 6s Plus, Samsung Galaxy S8+, Samsung Galaxy Note series, Sony XZ Premium, HTC U11, Xiaomi 6, OnePlus 3T, Huawei P10 and etc. 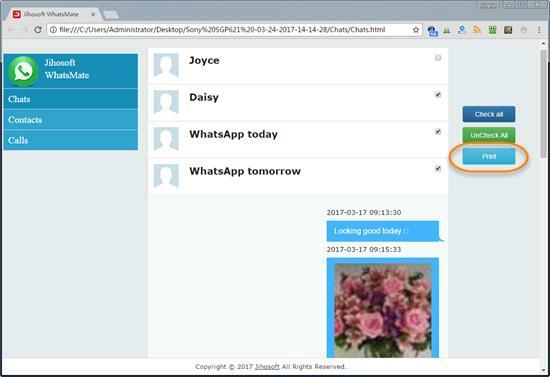 After you finish recovering the WhatsApp messages from your device, the chats are saved in HTML format on your computer. Now you should go to the destination folder, and open the HTML file named Chats. Then you can choose all WhatsApp chat history or just a conversation with a certain contact. Next please click the Print button on the upper right corner to print out the WhatsApp messages together with the WhatsApp photos on your iPhone/Android. Now you’re done! How easy and quick. Hurry up to free download the software on your computer to have a try.